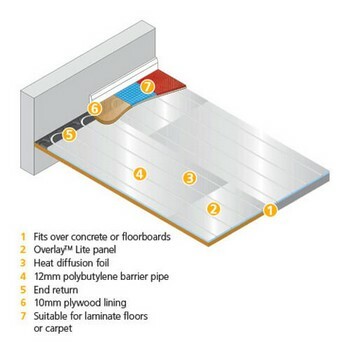 If you're looking for a way to install underfloor heating over an existing floor then one of the Overlay systems could be for you. There are three Overlay systems but they all have several things in common. They don't require the excavation of the floor or the mess of concrete or cement screeds. They can all be used with laminate or engineered wood flooring and can all be used with carpet. 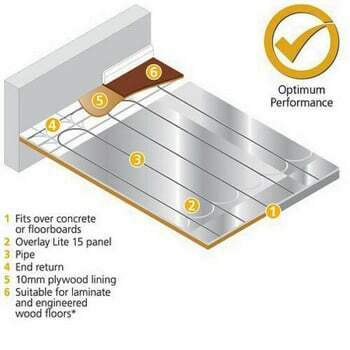 You simply lay the panels onto your existing floor, fit the pipe and install your floor coverings over the top. 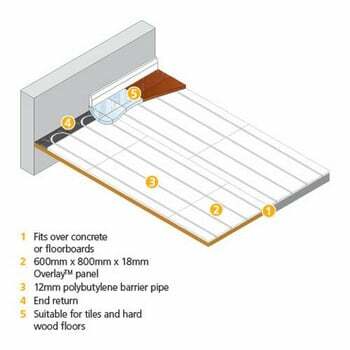 Overlay and Overlay Lite both use only 12mm pipe to keep the lowest possible profile and reduce head height in your room by a barely noticeable amount. Overlay Lite 15 uses 15mm pipe and so is more suited to larger projects. If you want to use solid wood or ceramic tiles then choose Overlay. They can both be attached directly to the floor panels or by using a layer of Plywood or MDF.